Despite the abolishment of decades-long literary censorship in 2012, Myanmar has seen a reverse in the direction of media freedom, particularly since 2014. 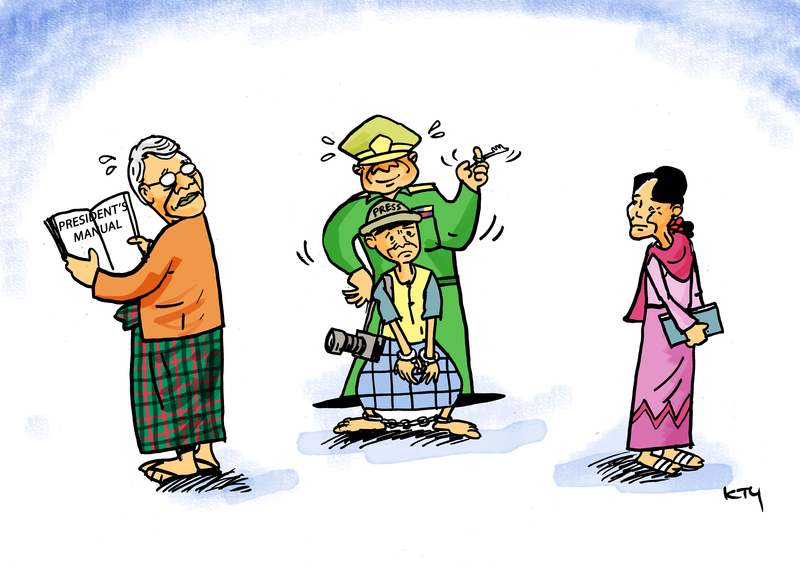 Here are a series of cartoons published by The Irrawaddy over the course of four years— from 2014 to 2017—reflecting the media milestones and hardships experienced in the country. In October 2014, freelance reporter Aung Kyaw Naing, also known as Par Gyi, was killed while in military custody. The Myanmar Army said the journalist was shot dead when he attempted to seize a soldier’s gun and escape detention. Despite his wife’s attempt to file charges against the military for the death and alleged torture of her husband, the case was dropped by the police and courts. Myanmar ended literary censorship in 2012. 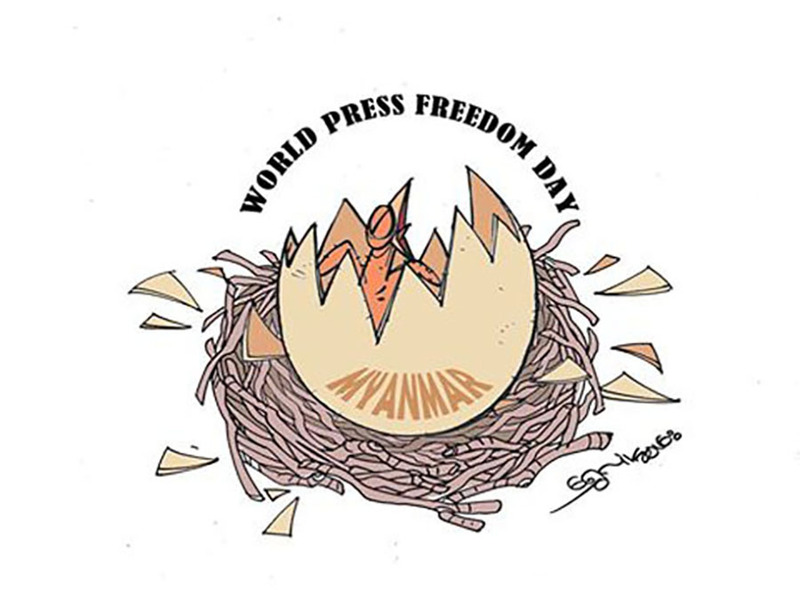 Four years on, in 2016 press freedom in the country is depicted as still in its infancy. 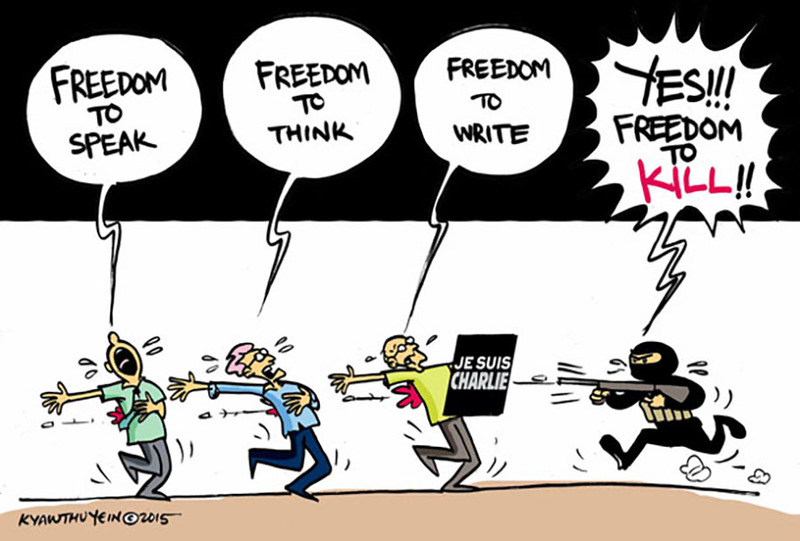 The Irrawaddy’s cartoonist responds to the terrorist attack on French satirical weekly newspaper Charlie Hebdo in January 2015 that killed 17 people. 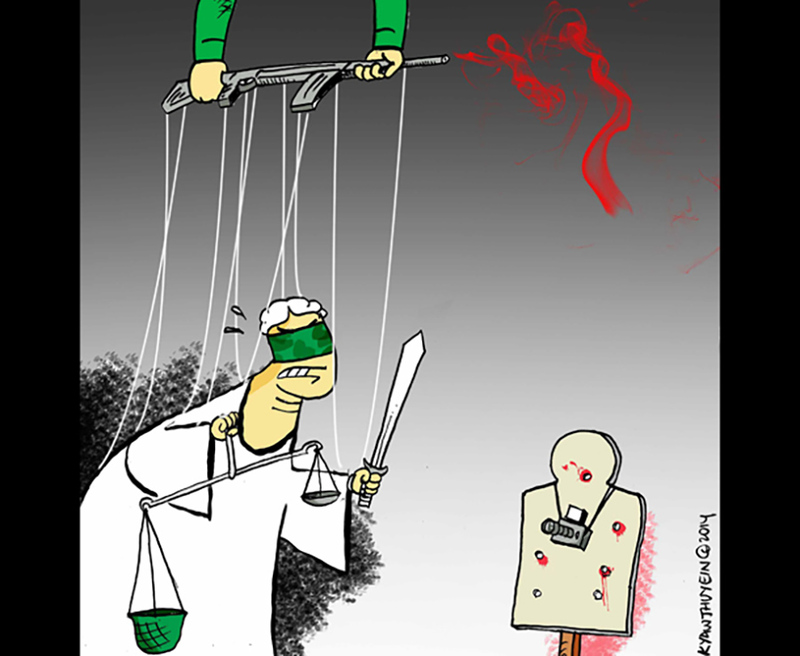 This 2014 cartoon demonstrates the control and lack of support for independent media in Myanmar. 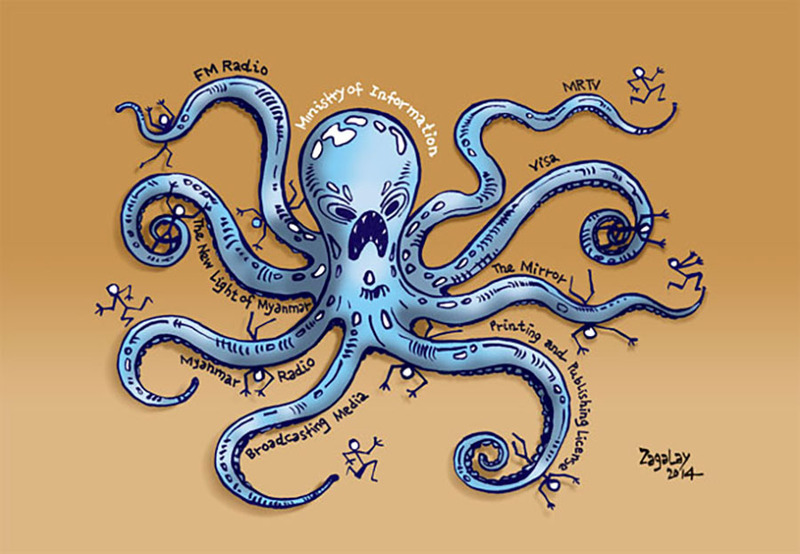 There have nearly 70 cases filed under Article 66(d) of the Telecommunications Law—which is used to prosecute “defamation” online—during the National League for Democracy’s government administration. Despite the booming private media outlets in the country, Myanmar’s Ministry of Information takes a lion’s share of control of everything related to the media industry. 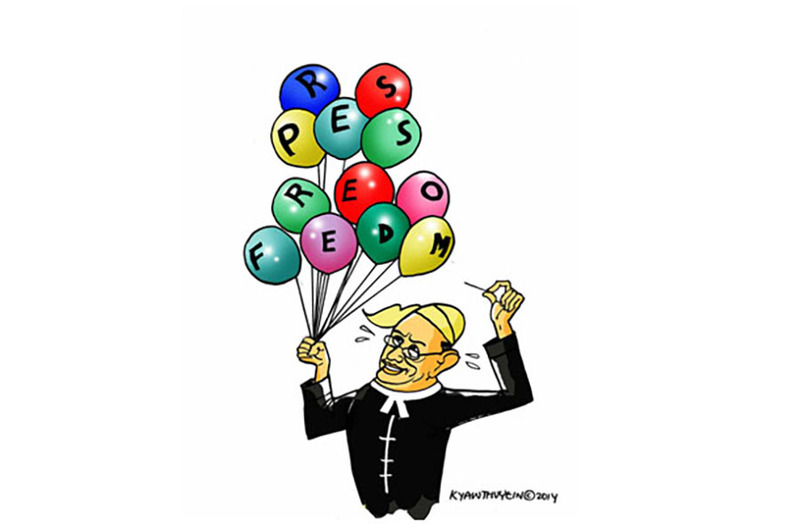 A 2014 cartoon demonstrates the precariousness of press freedom under the quasi-civilian government led by former President U Thein Sein. 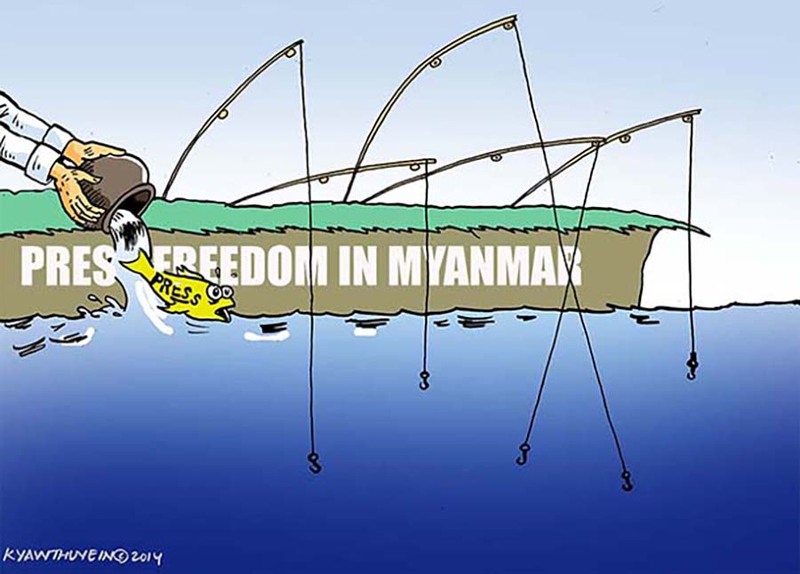 Under Daw Aung San Suu Kyi’s elected government, the Myanmar Army arrested three journalists, including one from The Irrawaddy, on June 26, accusing them of holding connections with an outlawed ethnic armed group. At the time of publication, they remain in prison.